This weekend, Janet and I went to the Michigan Lavender Festival. We had a great time at booths with everything from lavender oils to candles to foods (lavender honey is amazing!). But what grabbed my eye most was a piece of wicker patio furniture: a wicker chair named “Vickie”. She’s called “Vickie” because she dates from Victorian Era in the late 1800s. I was captivated by her details, especially the wicker scrolling on her arms, and the flower petal shapes on her back. Seeing how “Vickie” stood out among all the beautiful things at the lavender festival got me thinking about wicker patio furniture as an outdoor decór — as opposed to wrought iron or rust-proof aluminum. This is almost exactly like our Story on Pergola, in that wicker dates back to ancient Egypt. 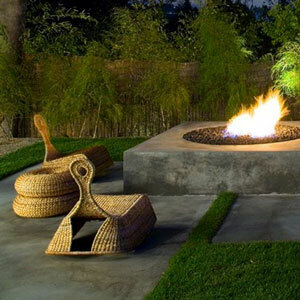 It was made from grasses and reeds, and some families could afford small tables. The Pharoahs had what may have been the first wicker chairs. Ancient Rome carried on the tradition — people in Pompeii used wicker baskets before Mount Vesuvius destroyed their city. During the time of Columbus, sea traders brought back rattan from Southeast Asia — a stronger material for wicker. 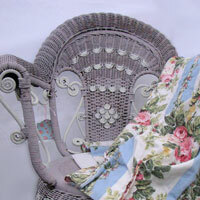 And in the 1800s, during the Victorian era, wicker’s popularity exploded. 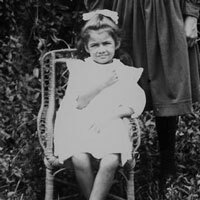 Here’s a girl from Australia around 1900 sitting in a Victorian wicker chair. In searching the globe for ways people use wicker patio furniture Americans, I started with Hawaii. It’s a place my wife and I visited on our 25th anniversary, and the palms and grasses make me think wicker would be a natural here. The patio below is NOT in Hawaii (it’s in Santa Monica), but it’s inspired by Maui, and certainly would look at home there. I love the pillows on the wicker sofa on the left! I’m not sure which island this on but what a view! I believe the wicker chairs are from Crate & Barrel. The ocean is stunning and I also love the leaf-shaped ceiling fans! Talk about a tropical porch! This beauty from Hawaii has rattan furniture, incredible colors, and an arched ceiling so beautiful I feel relaxed just looking at it! In a recent poll on our Facebook page, our fans voted Australia their 2nd of their most desired places to visit. (Hawaii was 1st). Here’s the same space from another angle. You can see how the patio integrated with the garden. I love the thickness of the chair and ottoman cushions! This dock with a wicker chair is in Sydney, about a 9-hour drive from Melbourne. I love the shape of this contemporary chair — it looks cozy! Elsewhere in Sydney (on Australia’s east coast) is this pool deck with contemporary wicker chaise lounges. 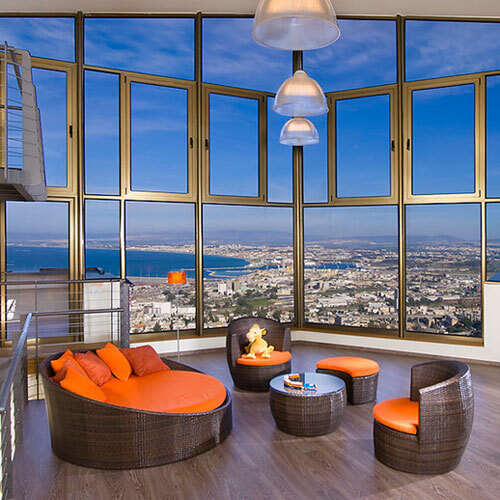 I could definitely relax here! (The piece of “tumbleweed” garden art on the right intrigues me!). United Kingdom — Drive a couple of hours west of London and you’ll find the historical “sea port” city of Bristol. That’s where this contemporary kitchen and wicker dining set open up to the outdoor garden beyond! 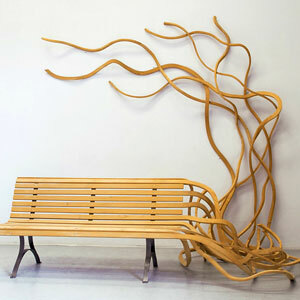 British Columbia — I love the woodsy look and feel of these handmade chairs woven from branches. The backyard is in Vancouver (one of several Canadian places on my “bucket list”). Ontario – I really like how these chaise lounge cushions and pillows look, and would love to stretch out and relax on them! This deck and patio are near Lake Joseph, a couple of hours north of Toronto. 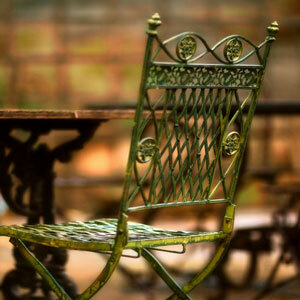 If you like beautiful patio furniture, check out our Story on Wrought Iron Chairs!